Children should be encouraged to take to the water from an early age, and swimming equipment provides safe learning tools and protection for young swimmers. By and large the swimming pool is safe environment but where there is water, there are always hazards, particularly for children. Therefore in addition to constant supervision, it is important all young pool users are given safe swimming equipment appropriate to their abilities in the water. Swimming can help develop a child’s coordination, social abilities and is believed to aid good sleeping and eating. It also provides a fun activity that can be enjoyed with the whole family. Buoyancy aids allow children to have fun in the water and learn to be independent whilst they increase in ability and confidence. There are a wide variety of floatation devices to suit all ages, abilities and wants, including armbands, floatation belts and rings, woggles and noodles, floatation jackets and an array of different floats. Whichever buoyancy aid you choose, it is vital that it is in a good working condition. Safety valves checked before each use. They should be squeezed gently against the face to feel for any leakage of air. If a buoyancy aid is damaged in any way, it will not only be dangerous to the safety of the child but will also have a damaging effect on their confidence. If inflatables are to be worn then they should fit properly. 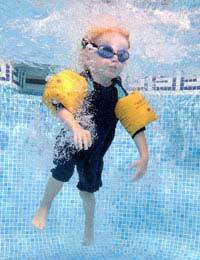 Inflatable armbands are ideal for kids starting to move about in the water independently. They are practical and inexpensive and although they restrict the movement of the arms a little, they still allow great freedom in the water, and enable the child to begin to learn how to kick their legs. When choosing armbands, it is important to follow the manufacturer’s guidelines on the appropriate age or weight of user. They should also be chosen to fit above the elbow as much as possible. Foam swim discs provide an alternative to inflatable armbands. They are individual moulded foam discs which can be worn on each arm in combinations of one, two or more, according to the confidence and swimming ability of the child. The advantages they have over armbands are their durability – they won’t pop for example – and their soft fitting on the arm. Water wings – For extra buoyancy these combine inflatable arm floats with an upper body float. Float suits and jackets – These clothing items are buoyant and provide completely unrestricted body movement. However they are also an expensive option that children will grow out of quickly. Rings and sit-in rings – Although not ideal as swimming learning aids and require constant adult supervision, they are nevertheless a fun and relaxing introduction to the water. Woggles – These are long buoyant cylindrical shapes that are designed for children to lean across and move about on by kicking their feet. Buoyancy aids are a way of easing children into swimming pool activity in a way that is fun and not so frightening, but in order to progress it is important that they don’t become too reliant on such support. For this reason it is important to slowly reduce the amount of buoyancy support. Swim goggles, earplugs and nose clips are swimming aids that are only suitable for children once they have learnt to swim and find that they require eye, ear or nose protection. Goggles are popularly worn in the swimming pool not just as a means to improve underwater vision but, more importantly, to reduce or prevent eye irritation. However, if the water is well maintained and swimmers only spend a short period in it then goggles are rarely needed. In fact many swimming teachers recommended that children don’t wear goggles whilst learning to swim. They believe that dealing with water splashing in the face and learning how to open your eyes underwater are key parts in building up swimming confidence. Ear plugs and nose clips should only be worn by children if they have been recommended by their doctor. They should first learn how to keep water out of their nose on their own and, like with goggles, become accustomed to the feel of water in their ears before adopting any protective devices.